Wow. It’s two-thirds of the way through November already, and I haven’t been out hunting for wildflowers for more than a month. It’s been a really warm and wet autumn, with not much blooming, and now even the asters are done. 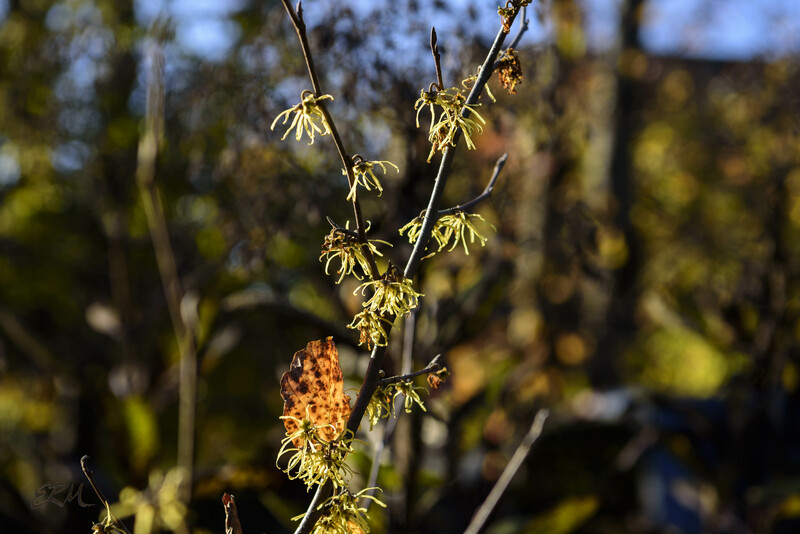 But one thing does bloom well into this month: witch-hazel, Hamamelis virginiana. 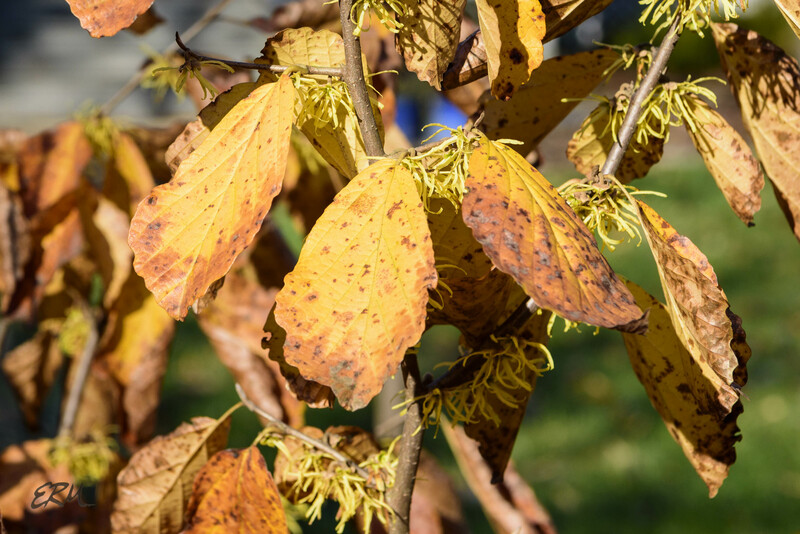 The one pictured here is in my garden, but you can find witch-hazel almost everywhere in Maryland, not to mention almost every county in the mid-Atlantic and New England regions. It’s also present in parts of the South and Mid-West. 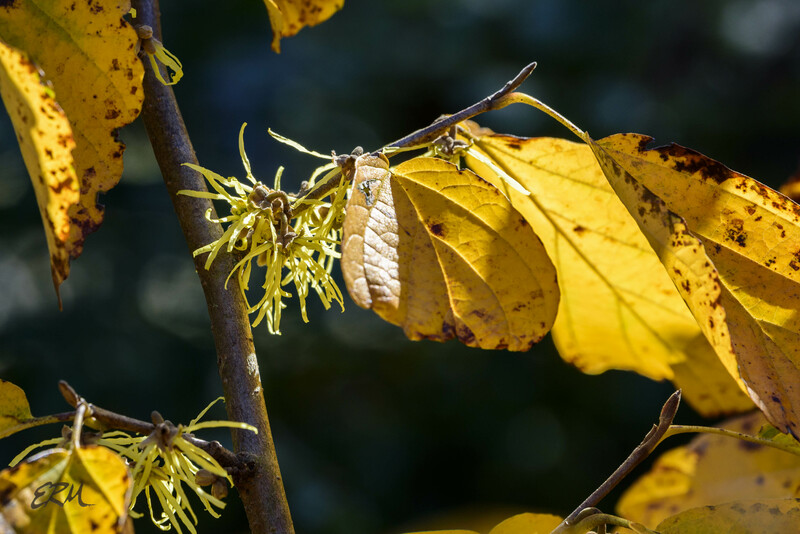 Witch-hazel grows as a small tree or shrub in the woodland understory, growing to about 12 or 15 feet. Most of the year it isn’t showy, but in autumn the leaves turn golden and frame wispy yellow four-petaled flowers. The leaves are broader at the tip than at the stem end, have wavy edges, and a bit of a crinkled look to the upper surface. They seem to hang on a little longer than other trees’ leaves. 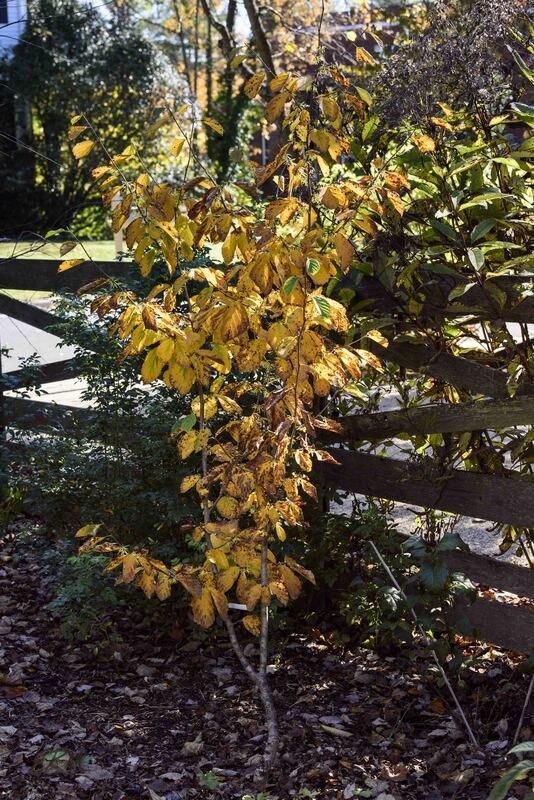 The witch-hazel family (Hamamelidaceae) is small, with only five other species (in three genera) that are native to the US. Of these, only one is found in Maryland: sweet gum (Liquidambar styraciflua), a large tree with distinctive, deeply-lobed leaves and spiky fruits. You can see some great pictures of them at the Maryland Biodiversity Project page. Like most of the plants around here, my blog will be going dormant for the winter. Probably. I might imitate skunk cabbage and pop up in January with some pre-season teasers. But if not, check back here in late March, when I’m going to be starting an interesting “citizen science” project. Witch hazel is a large shrub or small tree that grows in the understory of hardwood forests in eastern North America. It’s one of the last – maybe the last – plants to bloom in this area. 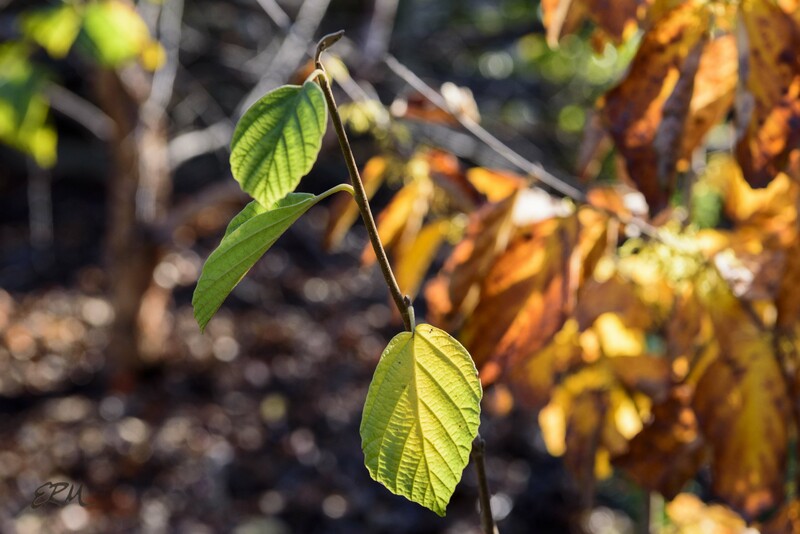 The flowers can persist through early winter, long after the leaves have fallen, and have an unusual odor that I find hard to describe. It makes me think of my grandfather. 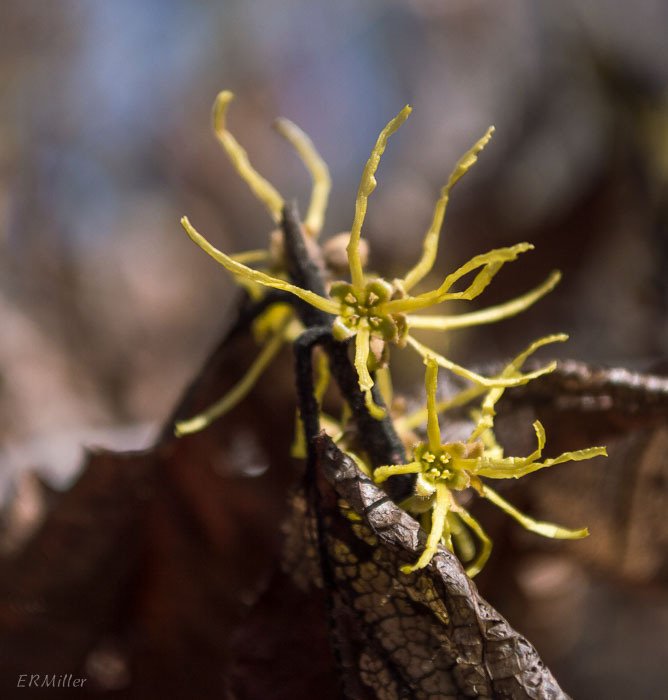 I know witch hazel is in the Potomac gorge area, but I took these pictures on the Riprap Hollow trail in southern Shenandoah National Park a few days ago. I would like to have taken pictures of a whole tree, but the nature of the trail, and a gusty wind as a cold front started moving in, made that impossible. While researching I tripped across this great article in The Atlantic. And another interesting article in the New York Times.